A RACI matrix, also known as 'RACI model' or 'responsibility matrix', provides a summary of the participation by the various YaSM roles in the service management processes. 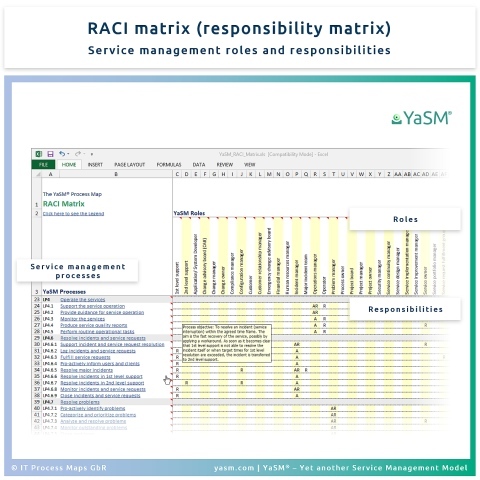 In this short video Stefan Kempter explains the basic elements of a RACI matrix and introduces the RACI matrix that comes with the YaSM process model, including examples of how the matrix supports your service management initiative. 1 What is a RACI matrix? A RACI matrix describes the participation by various roles in completing tasks or deliverables for a business process. It is especially useful in clarifying roles and responsibilities in cross-functional processes. RACI matrices typically contain a vertical axis (left-hand column) with processes, and a horizontal axis (top row) with roles - as illustrated in fig. 1. Those who do the work to achieve a task. There is typically one role with a participation type of Responsible. Those who are ultimately accountable for the correct and thorough completion of the deliverable or task, and the one to whom Responsible is accountable. Typically, the Process Owner is Accountable for a process, and there must be only one Accountable specified for each task or deliverable. Those who are not directly involved in a process but provide inputs and whose opinions are sought. Those who receive outputs from a process or are kept up-to-date on progress, often only on completion of the task or deliverable. Users of the YaSM matrix are free to add these types if required, although our experience shows that most organizations prefer a simpler type of matrix that is easier to maintain. There is a distinction between a role and individually identified people: A role is a descriptor of an associated set of tasks, which may be performed by many people; and one person can perform many roles. whereas in ARIS™ it is a special model of type "matrix model". "Microsoft®", "Excel®" and "Visio®" are registered trademarks of Microsoft Corp.
 "ARIS™" and "IDS Scheer™" are registered trademarks of Software AG. 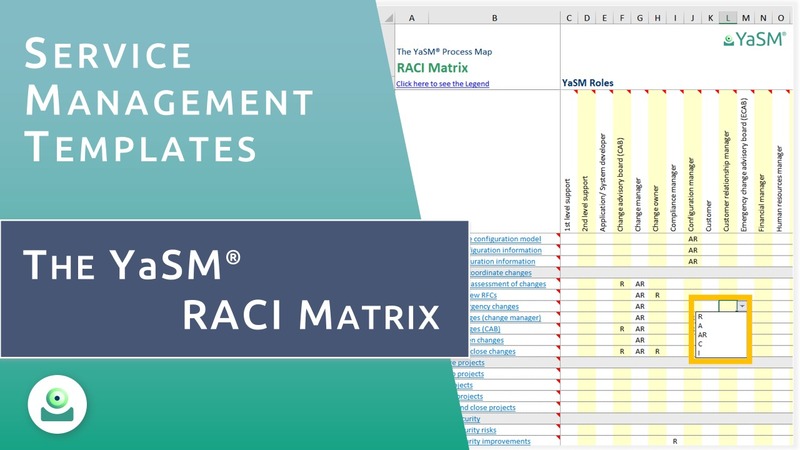 Is based on: RACI matrix included in the YaSM Process Map.